MX1 showcases its MX1 360 solution at IBC. Unterföhring, Germany, September 2018: This year at IBC, MX1 will again showcase cutting-edge technology developments and latest features for its game-changing next generation media platform, MX1 360. It will also demonstrate the breadth of its leading services for content aggregation, content management, channel playout, online video/VOD and content distribution services. MX1 360 is now integrated with AWS Rekognition, Amazon Web Service’s market-leading artificial intelligence engine, which provides powerful AI-based visual analysis to automatically generate searchable, descriptive metadata for video content. A new MX1 360 booking interface for Occasional Use customers allows full visibility into their submitted booking requests and will add further monetisation opportunities for broadcasters by providing post-event access to a content archive, ancillary files, clipping interface, and all required metadata. 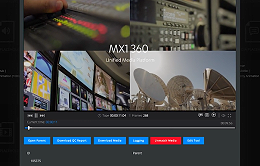 We will be highlighting the role MX1 360 can play in speeding up the editing process for sports highlights as well as its ability to unlock new workflows with cloud-based remote editing. And we will be previewing our new sports MAM interface, which provides easy, at-a-glance access to sports clips and matches, as well as management of advanced sports descriptive metadata for both team and individual sports. We will also have some announcements to make at the show. Make an appointment now to come and see us in our dedicated area on the SES Stand 1.B51.